GhostSlayer Jumps Out, Goes "Boo"
It's typical, isn't it? You wait months for a first-person, MotionPlus-utilising WiiWare title and then two come along at once. Not long after our hands-on with Rage of the Gladiator, Gevo Entertainment just emailed to let us know about its future WiiWare release GhostSlayer. Like Rage, MotionPlus is optional for GhostSlayer, adding directional support to your attacks as opposed to the "shake it and see" approach used by the Remote alone. 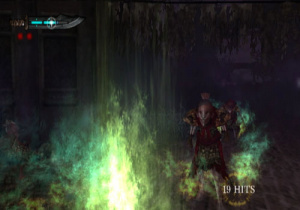 Familiar fighting gaming elements are present too, with special techniques, combo bonuses and directional blocking all available, with the emphasis on stringing together combo attacks to accumulate a high score. Here's the official trailer to get you in a ghost-slaying mood. With different swords to unlock as you progress, a range of enemy characters and an interesting score attack element, GhostSlayer certainly looks interesting, and with a Q1 release date pencilled-in we shouldn't have too long to wait to see whether it cuts the mustard. Certainly looks interesting and dark from the screens, could be worth a go though! Looks a bit like Dragon Quest Swords but with a more scary theme/setting. Might be interesting depending on how well it is put together. Looks awsome. I love me some horror themed games. Pretty awsome that this is for wiiware. Hope it doesn't take too long to come out. I prefer Red Steel 2. First-Person... Slasher? Heh, looks nifty. Not usually my kinda thang, but wiimotionplus and wiiware sword slashing? May give it a shot! FPS (S being slasher), looks pretty cool, will keep an eye on this one. It's about time we got an FPS, Horror game on Wiiware. Anyone else notice that there were no hands were visible moving the sword? I guess that makes it easier to implement motion plus controls when you have less to worry about animating or rendering. Looks interesting, but not much else. If it is offered at a low price, then I might buy it. My question is, can you control your character? I would like to be able to explore the world also. Well, it uses WM+, is on Wiiware and will be released before the end of the year. It will probably be 800-1200 Nintendo Points, so for an On-rails sword game it seems about right. Makes me want another Dragon Quest Swords. it will really cost only 600 points?